On behalf of the management of GCH Retail (Malaysia) Sdn. Bhd. we invite you to participate in the The Giant 1st Corporate Golf Challenge to be held at the prestigious Palm Garden Golf Club in Putrajaya. Every one is a winner! 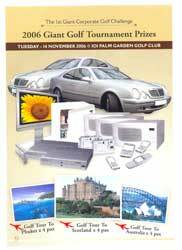 – attractive table & lucky draw prizes for all participants, and non-golfers attending dinner!